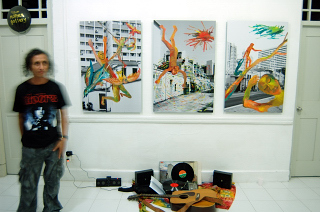 Raised, a unique art exhibition occupied a plot of land opposite 24hr Mustafa Centre on Serangoon Road, raised not just eyebrows, but erected a temporary statue, ran mini-art carnivals for 6 consecutive weeks. The art display and the carnival it ran, under the auspices of the Singapore Art Show 2007, drew thousands. 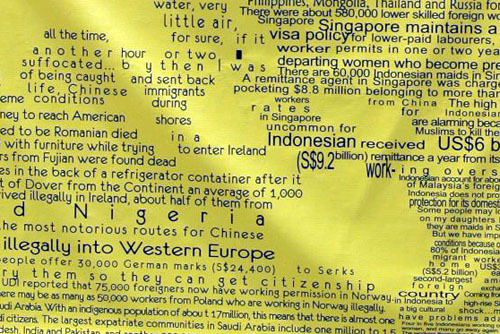 It seems only too appropriate to dedicate an exhibition to our migrant workers, and unbelievable that a tiny community of visual artists in little India had not done so before. The works exhibited, excuted with great economy were interactive and carnival like, and seem to embrace the view that “art is for everyone”. It almost seemed that art traded spaces with the intended viewer, climbing down from it’s plinth and replacing itself with a concrete figure, holding a shovel. I think the exhibition questions the value of art, along with a temporary idolised image of a foreign worker. As cliche as it sounds, it puts money where the mouth is, challenging perceptions of viewership dollar per head, effectiveness and ‘quality’ of art. 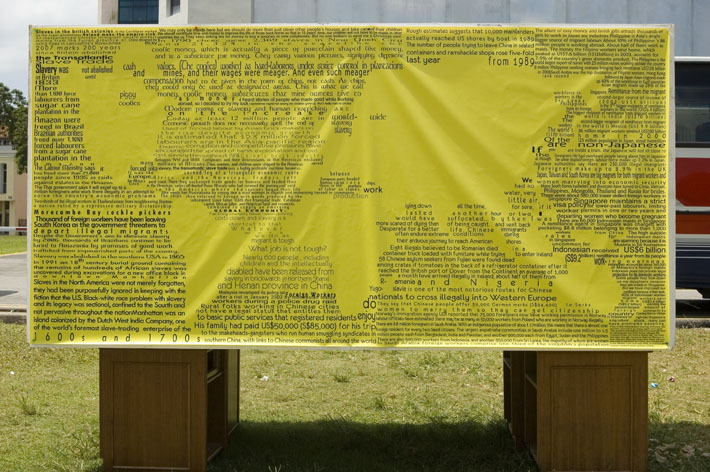 As the title “raised” suggest, standards are questioned, perceptions of migrant workers’ rights, and freedom to appreciate some kind of art – to view art at their convenience, a few hours only once a week. Besides choosing a carnival time suiting the bulk of Little India’s visitors, the issues of “greater consideration for migrant workers, in Singapore and promoting good employee- employer relations” are probably not directly addressed. Nor are issues of globalisation, colonial-lord-supremacy attitude that Singaporeans might have, are not clearly and explicitly announced here. The exhibition seemed to be a ‘social sculpture’, in the Joseph Beuys Utopian tradition, championing the social, cultural and political function and potential of art – reducing the prejudice migrant workers face. The people who need to pay attention probably would not find themselves in the middle of Little India on a busy Sunday evening when the art carnivals when held. while utopian ideals are targets and barely achievable, judging from the crowds, the exhibition must still be a roaring successful, and a fine example of public art engagement. The works by Judy Cheung offer a simple escape from the urban competitive bustle and hassle, by creating a series of low fidelity, low-cost procedures and ‘interactive games’. The works are comparatively raw, relationally charged to energize your low spirits, like a self-help book telling you that you are not as worse off as you think. The exhibition requires the facet of a child to appreciate – lots of imagination and appreciation for the simple home-made handicraft things in life. The work that got me hung up on are a stack of home-made transparent soap, with the words ‘family’, ‘friends’, ‘power’, ‘milieu’, symbolic of the various ‘achievements’ or ‘goals’ in one’s life. It is ironic that with each handling and use, they erode and grow thin, a power metaphor for the in-permanence and flux of our priorities in life as we age. Or should there be permanent priorities like ‘family’, where ‘blood is thicker than water’ and ideals like ‘love’? The works are conceptually charged to give to the viewer, more than most artworks. They are supposed to ‘heal’ or ‘message’ tired shoulders and bruised egos. Perhaps the exhibition demands less, like a walk in a park as opposed to an expensive day-out to an entertainment centre and it should not be as high-fidelity as I usually would have liked it. Otherwise, it does trigger some thought about the need to relax, but it does not give me the urge to keep to it. 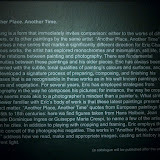 Perhaps what the exhibition needs is a more consolidated strategy to relate to the intended (Singaporean) audience, works that are slightly larger to fill the space, and a booth to boot the viewer to respond to the work with a built in recorder, to record our deeper, darker city-living, rising costs laments. “Mind of a City” is initiated as a dual-site project between Singapore and Vancouver. These two cities are paralleled as to suggest an ideal geographic landscape, characterized by multiculturalism, tourism, and complex government structures still burdened with complex social problems. As a participatory installation, it involves the production of a skill enhancement program strategically set up in a gallery, juxtaposing technology and the “think Green” concept. The work offers a non-linear, goal-orientated proposition to the contemporary urban environment, while examining critically the view that art, as a form of communication, is meant to elate the senses. As an assimilation of intellectual, social, and special/functional consciousness, the project references a society fraught with repression, anxiety and stress. Simultaneously, the experiential process of attending an ingenious skill enhancement program provides moments of whimsical inspiration in a gallery setting. 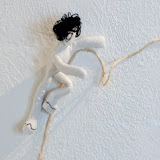 Judy Cheung had exhibited across Canada, USA, Europe and Hong Kong. 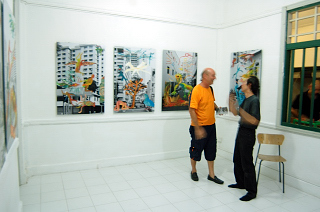 Her works were showcased in the 9th Havana Biennial 2006. Cheung’s essay, “On Throwing”, was part of the catalogue, published by Earl Lu Gallery for Site + Sight, Translating Cultures, 2003. Her innovative projects have been reviewed in gallery catalogues and magazines such as Canadian Art Magazine and Yishu Magazine. The works by Ruark Lewis and Jonathan Jones are orchestrated in a colour symphony of reds, blacks and whites. 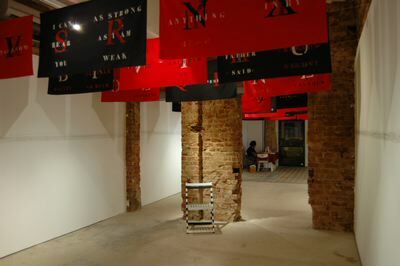 As one enters the space, you are greeted by ‘flags’ with superimposed printed text, objects that are painted over with stripes, and a curiously long sketch that stretches most of the perimeter of the wall space. 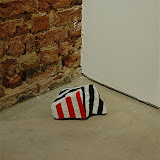 It takes a while accustoming to the arrangement of objects, and strain to hear the sound installation, desperate to make meaning and sense of the connection of the works to the title “Index of Kindness”. The gallery sitter Shafiq offered an explanation, that the title suggests the appreciation of the artists towards the institutions involved in the Asialink artists’ residency programme, and their desire to ‘record’ or make site specific works to Singapore and the new post-museum space. The audio work start to creep under one’s skin as we walk from the front space to the back, like being in a live theatre performance. The sound installation utters, stammers and bewilders. The cacophony range of nuances in ‘b’ and ‘s’ sounds, are startling and at best, brilliant. As the sound installation loops, we are presented with a range of bare minimal sentences, half uttered words that express Anger (the most distinct), Sadness, Calmness and so on. Ironically, a flag, a ‘sign’ and an object communicates too, with the stenciled words ‘silence is golden’. It leads me to speculate that the works could deal with the gaps of communication, between silences, mutters and tone of voice. We are forced to rethink our own utterances. I am reminded of every annoyed ‘Zh’ sound or frown that one makes unconsciously to loved ones at arguments, delightful chuckles at good jokes and words swallowed just when it is about to be said, ashamed and dejected. The exhibition is indeed an index, of sound and lines drawn in red and black – both over objects like 60’s performance artist Daniel Buren and in a large panoramic sketch of some coastal line. This index is perhaps indeed a record of the artist’s presence on the tiny island, compared with the vastness of Australia which the artists are from. If one compared them to mark makings of the caves of Lascaux, are these marks to show their presence, marks of territory or simply records of events, places visited? Either case, the shoreline they have chosen to depict is densely built-up. Space here is condensed, flattened, stretched into new meaning and representation of actual space, challenging the nature of drawing as well. One can argue that emotions are also drawn symbolically here, in red for anger, shades of grey to black for other possible emotions over the space of the gallery, pervading like a radio drama breaking up. On hind sight, the exhibition does come together well, challenging definitions of space and sound art. As a site specific artworks, they do mirror the curiousity of passerbys that peek into this new artspace on infamous Rowell Road. The recent solo exhibition by Eric Chan breaks new ground in terms of concept and technical consideration for any local painting exhibition. The works featured resemble uncanny, large photographic negatives of enlarged portraitures of canonical artworks from across the centuries in Western Art, suggesting the close relationship photography has with painting, and vice versa. Dutch painter Vermeer used a camera Obscura in his composition to create realistic, perspective observational paintings. As did many other painters in Western Art History who used optical devices to ‘trace’ from real life, as explored by British Artist David Hockney, in his thesis and BBC documentary “Secret Knowledge“. Perhaps this diminishes somewhat the myth of a ‘born’ draughtsman, but should rekindle our interest in realistic paintings, and artists’ technical processes of composition and art-making. This reference to photography is a clue the artist Eric Chan acknowledges his use of digital manipulation to create the black and white negative image before transferring them onto the canvas. The blackened gallery, and carpeted floor resembles the kind of scale and effect normally reserved for Hayward Gallery (London) block-buster shows, enhancing the appearance of the paintings numerous folds. The mood is solemn, encouraging a quiet, albeit standing contemplation of what Western Painting is – because the monochromatic, negative inversion forces us to look only at the composition, positive and negative space more prominently than the sitter’s (or original painting’s) identity. Perhaps by this looking, we are purged of the need to refer and acknowledge the epitome of paintings lie in the Renaissance and Baroque, and there is still space for painters today, and in Singapore to question their hegemony over the idea of Representation and technical supremacy. There are two components in Lee Wen’s recent exhibition at Your Mother Gallery, and it is necessary to see them separately – the performance “Too Late the Hippie” and the paintings. The performance was brief, sermon-like and the late-comers stood at the door, straining to hear what the artist had to say. The text read by the artist summed up his personal interpretation of Hippie culture, portraying himself as a protagonist for a lot of ideals that were prevalent artistic concerns of the 60’s. Perhaps it’s a foreboding sign that even some performance art today will share these hippie-like reactions – make peace not war. Is this deja-vu feeling a suggestion of the hegemony Western Art History has over wordly performance art? The paintings or black and white photographs, are cryptic and symbolic like naively painted murals in a buddhist temple – the sign of a bald man, if one didn’t associate this with the artist’s personal would think of a monk, a bird, a bird-man, a man-tree, bolts of sunlight and so on. The exhibition title seem to be a prelude to the forthcoming “Future of Imagination” (FOI) performance art festival to be held in Singapore, initiated by Lee Wen, as the initials FODMOI do kind of remind you of FOI. The paintings sit uncomfortably between child-like doodles — in it’s selection of stark colours, and composition — and National Archive type prints of the area surrounding the gallery. 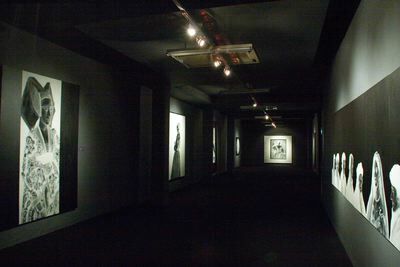 The black and white photographs are mounted on aluminum plates in a contemporary fashion, presenting a simple documentary of the area along Jalan Besar Road, nearer to Hindoo road. The aesthetics clash violently between the two media, and one is forced to reexamine the work in the context of the artist’s earlier performative yellow man series – they works could represent the juxtaposition of one’s imagination on reality, how modern day living grows violently on heritage-rich sites, in a cinematic sensibility seen here. The two best pictures, in terms of formal picture analysis, are the “one with the growing tree”, and “the one with City Square looming ominously in the background”. One could also choose to see these as DADA actions, defying logic and ‘ruining’ good black and white photographic images. Whichever the case, the bold move by the artist sets the platform to reconcile thought and motivation behind his performative actions, and physical two-dimensional works that speak for themselves. 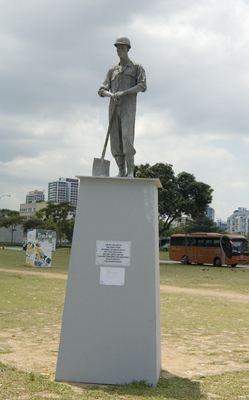 While this speech is incoherent, like spasms of dialogue from someone else’s dream, we are compelled to search for our own meaning in-between the surfaces of paint and photographic image, and in-between convulsive interpretations of Singapore culture – to celebrate the melting pot of cultures and/or to promote rich ethnic traditions and heritage. The book “Republic of Daydreams” are available from Your Mother Gallery.